Dinosaurs are frequently cited as the ultimate exemplars of failure. “Dead as a dinosaur” has become deeply embedded in our vernacular. Yet death for a species, and even for groups of species, is as inevitable as your death. Somewhere around 99% of all species that have ever existed are now extinct. The 10-50 million species that comprise the modern day biosphere (the uncertainty due mostly to our lack of understanding of microbial diversity) are but the latest players in a four-billion year drama—“The Greatest Show on Earth,” to borrow the title of Richard Dawkins most recent book. Similarly, the event that decimated the dinosaurs about 65.5 million years ago killed off only those forms like Tyrannosaurus rex and Triceratops horridus alive at the end of the Cretaceous Period (with the exception of some birds, which managed to survive this biologic bottleneck). Dinosaurs had existed for 160 million years prior to that doomsday event, birthing a bewildering array of forms that succumbed to the scythe of extinction long before a giant asteroid slammed into the Gulf of Mexico. By comparison, we humans have been around a mere 200,000 years or so, and our small clan of bipedal primate cousins originated about 6 million years ago. In other words, dinosaurs are a great success story rather than a bunch of prehistoric washouts. The notion of dinosaurs as failures underscores a pair of conditions that threaten the persistence of humanity: myopia and hubris. Lacking a meaningful sense of deep time, we tend to lump all pre-human life-forms into a single box labeled “extinct.” Virtually blinded by our severe temporal myopia, we ignore the multi-billion-year skein of lifeforms, the dramatic comings and goings of organisms through the geologic ages. Meanwhile, our hubris derives from a worldview that transforms other life forms to objects, and places humans not only outside but superior to (nonhuman) nature. While I confess to a certain personal bias on the matter, it’s simply ridiculous to thumb our noses at dinosaurs and laugh derisively at their present day absence. We might as well speak contemptuously of our great grandparents; after all, they’re no longer with us. Ecology and evolution are deeply intertwined. Just as the death and decay of organisms provide raw materials for subsequent generations, so too the deaths of species spawn new possibilities for future generations of species. Without extinction, there would be insufficient ecological space for evolution to explore alternative solutions and diversify into new life forms. When initially faced with some change to their native environments, species don’t grimly stay put and evolve into new forms better suited to the transformed conditions. They move, tracking the old habitat. In general, it’s only when the old habitat disappears that species are forced to adapt or die. Mass extinctions—the dying off of multiple, distantly-related lineages over vast areas in a short span of time—occur when external forces alter or wipe out a range of environmental settings, cutting off opportunities for tracking habitats. This time around, a single species—Homo sapiens—has become the external force driving the decimation of millions of other species. Yes, we are the asteroid now colliding with the planet. The list of anthropogenic factors is all too familiar, among them habitat destruction, overhunting, toxic pollution, and climate change. In particular, the duo of global warming and environmental destruction has eradicated habitats at a pace far exceeding the abilities of many species to track or evolve. At the current rate of extinction, about half of all species alive today will be extinguished by the close of the 21st Century, an eco-evolutionary experiment not run since the end of the Cretaceous. Paleontology teaches us that the biosphere takes up to 10 million years to recover from a major mass extinction. So the decisions we make today will have cascading consequences well into the unimaginable future. Are we (currently) capable of wiping out life on Earth? No. Although this claim is commonly made, life has persisted without hiatus for almost four billion years, and it will be here long after the last human. Life forms at the small to microscopic end of the size spectrum are the most resilient, some of them hunkered down miles below the Earth’s surface. Humanity, on the other hand, is nowhere near immune from the profound changes now taking place. Like it or not, we are inextricably embedded into nonhuman nature and dependent on its flows of energy, food, and water for our very survival, as well as for our physical, mental, and emotional health. So we have every reason to raise our awareness of these issues and act accordingly. Nevertheless, notwithstanding many years of dire warnings from biologists, the sixth extinction has barely touched the collective consciousness of Western cultures. Global warming currently garners the media spotlight, yet recent polls show a significant drop in the numbers of people concerned about this issue. Despite the bounty of rhetoric, we’re not behaving as if we live on a planet in peril. Consider the recent climate change summit in Copenhagen, where world leaders had a unique opportunity to make history, but failed to reach a meaningful agreement. At this pivotal moment in history, we lack the strength of public opinion necessary to spearhead a WW II-style mobilization to achieve sustainability. Why? In large part because we’re crippled by an outdated worldview. As a species, we need new glasses capable of curing our temporal myopia and inserting us back into the evolutionary epic--the Great Story. We need a mindset that moves beyond our human-centered hubris and inserts us back into the natural world. Learning the scientific truth of the matter is part of the solution, but connecting with the nonhuman world through direct experience is equally important. Those of us raised in urban settings may find it tough to establish meaningful connections of this sort, but we can make key steps in the right direction. We can also encourage our children move beyond our limited perspective—to see the world in new, healthier ways that are truer to our nature and critical for a sustainable future. "But hold on a minute Sampson," I can hear you saying. "If all species eventually go extinct anyway, why should I lose sleep over the current hemorrhaging of life forms?" The answer to this question comes down to ethics, morals, and values. Do we have the right to kill off other species? Do we have the right to rob future human generations of the opportunity to see a whale, a tiger, or an elephant in the wild? More to the point for most of us, is it reasonable that we knowingly bring about the downfall of civilization while alternative paths lie before us, untaken? Your call. The past few weeks have witnessed a spate of remarkable announcements about feathered dinosaurs. 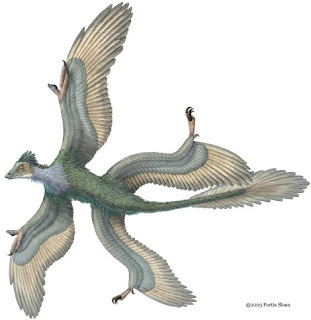 First came the story of University of Kansas scientists reconstructing feathers on the four-winged Microraptor to test the gliding abilities of this little dinosaur (1) ; the authors concluded that Microraptor was fully arboreal, spending it’s lifetime largely in trees, and that avian flight likely evolved from the trees down rather than from the ground up. Next came stunning back-to-back news from two different teams that reconstructed color in the feathers of dinosaurs, giving us our first glimpses of dinosaur coloration (2, 3). Most recently, a study by David Hone and colleagues (4) clearly demonstrates that the feathers of Microraptor attached directly to the bone, as in birds living today, and that the feathers are preserved in life position, rather than being displaced after death, as some have argued. Together, these announcements got me thinking about the larger meaning of feathered dinosaurs. Beyond the amazing (and seemingly unending) succession of discoveries, most based on exceptionally preserved fossils coming out of China, what larger lessons might we take away from these so-called “dino-birds”? Below I describe my top three. Other paleontologists would undoubtedly come up with different lists, and the items noted here would apply equally well to many non-dinosaurian phenomena. Yet I think that the burgeoning science of feathered dinosaurs admirably underscores each of these points. Scientists like to talk about the limits of science—that is, the limits what’s knowable through scientific investigation. In doing so, we’re prone to make claims like, “Blah-blah-blah [insert topic here] will never be known with any degree of confidence.” Then along comes some bright, skeptical (typically young) investigator who finds a way to probe the supposedly intractable question from a new angle, making those earlier claims seem foolish. This is exactly what happened with dinosaur colors. Limited largely to fragmentary piles of bones and teeth, many paleontologists have lamented that we will never know the colors of dinosaurs. Then it was discovered that fossilized feathers preserved with some Chinese theropod dinosaurs preserve a color-bearing melanin pigment called melanosomes, and that these color-specific cues can be used to reconstruct feather coloration. Anchiornis is the smallest known dinosaur, about 13 inches long and 100 grams (~4 oz), somewhere between the size of a robin and crow. It was also the animal for which Quanguo Li and colleagues(3) reconstructed coloration over the entire animal. The authors state that “[T]he body was gray and dark and the face had rufous speckles. The crown was rufous, and the long limb feathers were white with distal black spangles.” This claim is astonishing. Just five years ago, few would have imagined that we would ever have the hard data to make such a statement about any dinosaur. 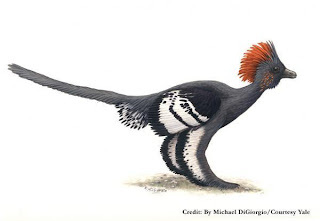 And keep in mind that Anchiornis lived more than 150 million years ago! When it comes to paleontology, many of these surprising insights are possible only because of the application of new technologies. The discovery of dinosaur color depended on the ability of researchers to explore the shape and density of melanosomses in the microstructure of feathers. Similarly, Dave Hone and his colleagues(4) had to examine Microraptor fossils under ultraviolet light to see the detailed interface between bones and feathers. The lesson here? Feathered dinosaurs teach us to never say never. Questions that appear impenetrable at the moment may well become answerable in the future with the advent of new technologies and new ways of thinking. At the moment, we have no way to determine the skin colors of non-feathered dinosaurs like T. rex or Triceratops. But don’t bet on this staying unknown. History tells us different. There is a major bias among nonscientists that we’ve pretty much figured out all the big stuff about nature. All we’re doing now, people seem to think, is making minor adjustments to our understanding—adding a few more grains of sand to the mountain of knowledge. This myth is perpetuated by school textbooks, which tend to give the implicit impression that the topic under consideration (e.g., biology, chemistry, physics, etc.) can be summarized as an accumulation of facts. Feathered dinosaurs teach us differently. When I was a kid, dinosaurs were depicted as sluggish, dim-witted, swamp-dwelling, drab-colored behemoths sharing far more in common with Godzilla than with chickens. Thanks largely to the discovery of bird-like dinosaurs, sometimes called “raptors,” this view has been tossed on its head. Almost overnight it seemed, dinosaurs emerged from the swamps as complex, fast-moving, brightly colored creatures with a range of complex behaviors previously unimagined—for example, nest brooding, herding, and burrowing. Feathered dinosaurs showed us that not all of these ancient reptiles were giant; indeed some were no larger than mid-sized birds. To my knowledge, no one in the 1960s pictured little four-winged dinosaurs living in trees. Science has only scratched the surface of what might be known. To use dinosaurs as an example, more “new” varieties of dinosaurs have been named in the past 25 years than in all prior history, with no signs that the well of discovery is running dry. Similar kinds of statements might be made for virtually all areas of science. Even in disciplines such as physics with a much longer track record than paleontology, ground-breaking, innovative work remains to be done. Science has tended to create artificially walled “silos” around each discipline, walls that today are being torn down. As a result, some of the most exciting work done today occurs at the interfaces of once separate disciplines, often with appropriately hybrid names like “geobiochemistry.” I am excited about 21st Century paleontology, which is becoming increasingly integrated, synthesizing the traditional study of fossils with knowledge and tools from such disparate fields as geochemistry, histology, molecular biology, and paleoclimatology. There’s no question—countless exciting discoveries await talented, hard-working folks with access to as yet unimagined tools. Expect the unexpected. Despite the fact that we just celebrated the 150th anniversary of Darwin’s famous treatise on biological evolution, and even though virtually all practicing biologists regard evolution as the abundantly documented centerpiece of their field, only about one half of Americans accept the veracity of this idea. Anti-evolutionists frequently make the claim that we paleontologists have no evidence of intermediate forms in the fossil record. Feathered dinosaurs tell a different story. When I was a kid, life was a lot simpler. Even kids knew that reptiles (including dinosaurs) had scales and birds had feathers. This naïve categorization has been roundly defeated by not one or two but well over a dozen kinds of dinosaurs with feathers or feather-like structures (but see note below). Indeed the line between dinosaur and bird has blurred to the point that paleontologists frequently describe a new Mesozoic beast as a bird only to have others show that it’s a dinosaur, or vice versa. Back in the old days (i.e., when I was a kid), biologists often spoke of missing links. In one sense, feathered dinosaurs are exemplary missing links. In another sense, these “dino-birds” underscore the double inaccuracy of the term; missing links are neither missing nor links. Most trivially, intermediate fossil forms are not missing because we’ve found them. More profoundly, they are not links, because evolution rarely follows a simple, ladder progression, with one form evolving into another and so on. Instead, evolution typically branches like a bush, generating not one but numerous lineages that spawn variable numbers of descendents and persist for differing amounts of time. Feathered dinosaurs are an ideal example of this kind of arborescent evolution. Microraptor and Anchiornis are not directly ancestral to modern day birds, but their lineages branched off the dinosaur family tree around the same time as birds did. That’s why they share so many features with living avians, including true feathers. Dinosaurs aren’t extinct. They fly around above our heads today, charm us with their songs, and adorn our dinner tables. In that sense, all birds are feathered dinosaurs. And they’re not the only well documented example of transitional fossil forms. We have similarly robust evidence for the origin of amphibians, whales, and many other groups—including hominids. Evolutionary biologists need to do an even better job of taking their message public. Evolution happens. 1) Alexander, D. E., E. Gong, L. D. Martin, D. A. Burham, and A. R. Falk. 2010. Model tests of gliding with different hindwing configurations in the four-winged dromaeosaurid Microraptor gui. Proceedings of the National Academy of Science. doi: 10.1073/pnas.0911852107. 2) Zhang, F., S. L. Kearns, P. J. Orr, M. J. Benton, Zhou, Z., D. Johnson, Xu. X & Xiaolin W.. 2010. Fossilized melanosomes and the colour of Cretaceous dinosaurs and birds. Nature, doi:10.1038/nature08740. 3) Li, Q., Gao, K.-Q., Vinther, J., Shawkey, M.D., Clarke, J.A., D'Alba, L., Meng, Q., Briggs, D.E.G. and Prum, R.O. "Plumage color patterns of an extinct dinosaur." Science,. doi:10.1126/science.1186290. 4) Hone, D. W. E., H. Tischlinger, Xu X., Zhang, F. 2010. The Extent of the Preserved Feathers on the Four-Winged Dinosaur Microraptor gui under Ultraviolet Light. PLoS ONE, 5(2): e9223. doi:10.1371/journal.pone.0009223. Imagine sitting on a hillside a few miles outside, Athens, Greece, 500 years ago, in the year 1510. It‘s a beautiful, cool winter’s night, an hour before dawn. Lying back in the tall grass, a light breeze rustling through the olive trees, you can’t help but be awestruck by the starry heavens riven by the ghostly Milky Way. Jupiter is clearly visible overhead, and a crescent moon hangs low over the eastern horizon, closely attended by Venus’ bright beacon. You contemplate the three crystalline, transparent spheres that support this trio of celestial wanderers. Four more spheres bear the remaining cosmic vagabonds: Mercury, Mars, Saturn, and the Sun. These seven hollow spheres are nestled within an outermost orb that hosts the magnificent “fixed stars” now circling languidly overhead. Sitting at the core of it all, unmoving, is Earth, where you now lie embraced by the universe. From the time of Aristotle and Ptolemy until the 17th Century, this pre-Copernican understanding of the cosmos held sway in Europe. Ptolemy’s universe shared many features with the thousands of indigenous cosmologies that preceded (and followed) it. Topping the list of commonalities was a profound sense of being inside the universe. One of the feelings most closely linked to interiority is intimacy, and the geocentric vision was remarkably intimate—Earth cradled within nested, invisible spheres. Then along came Nicholas Copernicus and the revolution that still bears his name. Centuries later it’s difficult for us to fathom the staggering vertigo that 17th Century Europeans must have felt as they digested the knowledge that Earth was no longer enveloped by the cosmos. First to be shattered were the innermost seven crystalline spheres of the wanderers; suddenly Earth was a wanderer as well. Eventually, the eighth and outermost sphere bearing the stars was also demolished, exploded into a vastness that continues to defy imagination. Humanity had been ripped from the bosom of the cosmos. During the 20th Century, the loss of intimacy with the cosmos only deepened. Western civilization was forced to grapple with the reality that our natal solar system sits in the outer reaches of a pinwheel galaxy of billions of stars, many of them circled by planets of their own and, for all we know, life. 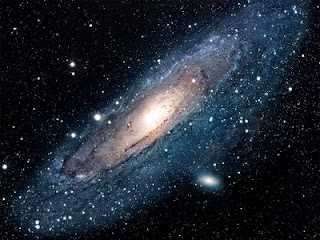 Our galaxy, in turn, is one of billions, each one home to billions more stars and hosts of planetary systems. An ancient sense of interiority was replaced by isolation and exteriority—Earth drifting alone in the immensity of space . . . nowhere in particular. The scientific revolution also exacerbated the loss of interiority and intimacy with nature here on Earth, transforming the vibrant lifeforms of our world into dead, unthinking objects—mere machines to be disassembled, studied, and controlled. Lacking a sense of belonging both cosmically and locally, we were rendered homeless, a dangerous state of affairs from which Western civilization has yet to recover. Using metaphors and other linguistic devices, we humans literally construct our sense of reality. We have spoken an unsustainable world into existence, and we’ll continue to live in this world until we learn a different story. I'M CONVINCED THAT WE now sit on the cusp of another Copernican-style revolution, one with equal potential to trigger a dramatic transformation in our understanding of “reality.” This time, however, the shift in perspective will be in reverse--from exteriority to interiority, from isolation to intimacy. Perhaps ironically, science will again play a key, though not exclusive, role. In their recent, marvelous book(1), Joel Primack and Nancy Abrams demonstrate how the past century of cosmological investigation has re-established a central place in the universe for humanity. For example, we exist at the cosmic center of size scales, smack dab in the middle between the smallest and the largest things known. And, like all places in the universe, we appear to be at the temporal center of everything; the concentric crystalline spheres of the ancient Greeks have been replaced by concentric spheres of time—the further you look in any direction beyond our native galaxy, the deeper back in time you glimpse. Yet centrality does not necessarily confer interiority. For the latter, we must look to the Great Story(2), the epic of evolution that spans the history of everything, from the big bang to us. This grand saga, defined with some degree of rigor only in the past few decades, transforms the universe from a colossal expanse of mostly empty space into a dynamic, evolving unity in which we are inextricably enmeshed. Those distant stars that brilliantly adorn the night sky turn out to be our long lost cousins, both of us spawned from the wombs of previous stellar generations. The same story tells us that the myriad lifeforms with which we share this blue-green world are also cousins, all of us descended from single-celled ancestors. And the most recent chapter traces all human cultures to a small band of Africans whose descendents spread around the globe. Feelings of intimacy are not founded upon physical proximity so much as a sense of connection. Think of the intimacy gap separating two strangers sitting at a restaurant table from a pair of lovers occupying those same seats. Those lovers could be separated by many thousands of miles and still feel intimately connected. Similarly, we have the potential to form a meaningful sense of connection with the nonhuman world, from the red-breasted robin that alights briefly on the windowsill to the fiery crimson eye of the constellation Taurus. These bonds can be forged through a deep, visceral understanding of the ancestry that unites everything into a single unfinished story, a story in which we now play a critical part. Now imagine lying on a mountaintop in Colorado 100 years from now, in the year 2110. Venus shines brightly through the last wisps of fuchsia clouds as the spinning Earth plunges North America into another bout of darkness. Within minutes the sky is filled with burning pinpoints of light, the fires of distant suns. A familiar sense of wonder rises like a tide. Over in the direction of the archer, Sagittarius—hard to discern amidst the misty band of starlight crossing the sky— is the center of the Milky Way galaxy, the cosmic whirlpool we call home. You contemplate the fact that all life on Earth (and everywhere else) is made from stardust, that everything you can see is part of a single, expanding unity that began its journey 14 billion years ago. You note the simple act of breathing, how it involves exchanging matter with the bounty of living things around you. Feeling your body sink deeper into the Earth, you are transformed into a whirlpool, an evanescent concentration of energy—you and the Milky Way swirling within the same river. 1. Primack, J. R. and N. E. Abrams. 2006. 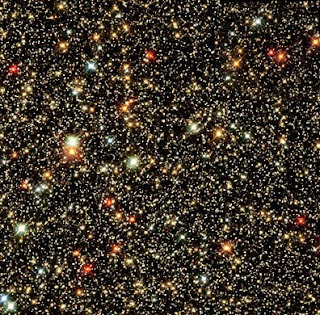 The View from the Center of the Universe: Discovering Our Extraordinary Place in the Cosmos. Riverhead Books, New York, 386 pp. 2. Swimme, B. and T. Berry. 1992. The Universe Story: From the Primordial Flaring Forth to Ecozoic Era. Harper Collins, New York, 305 pp. This past Friday, I had a truly remarkable experience. While visiting the Cleveland Museum of Natural History to give a talk in support of my recent book, I agreed to participate in an informal “meet and greet” with some local kids. When I walked out into the museum’s dinosaur hall at 2:00 pm as scheduled, I was, to put it bluntly, blown away. Here’s why. I am not a big watcher of television. And I’m very concerned about the vast amounts of time that kids today spend staring at screens—not just TVs but computers, cell phones, and electronic games—instead of being outdoors. At latest count, children’s screen-time averages an astounding 10 hours per day. So when I was approached by Halle Stanford, Executive Vice President of Children’s Entertainment at The Jim Henson Company (you know, the creators of the Muppets) about advising on a new television series for preschoolers, I was skeptical to say the least. When she then told me the proposed name of the series—Dinosaur Train—I didn’t know whether to laugh or cry. About half of all Americans believe that humans and dinosaurs lived at the same time, a staggering statistic that speaks as much to the current state of science education as it does to the influence of the religious right. As a paleontologist and science communicator, I regularly find myself (re-)stating the facts: dinosaurs (other than birds) died out more than 65 million years ago; humans first appeared only about 200,000 years ago. So the idea of mixing dinosaurs and trains in a television series sounded misguided at best—the Flintstones all over again. But Halle went on to explain the show’s concept. A kid T. rex named Buddy is adopted by a Pteranodon family. Anxious to discover the identity of his species, Buddy sets out with his family members on the Dinosaur Train (operated by Troodons of course, the smartest dinosaurs) to travel around the Mesozoic and meet other creatures. Humans and dinosaurs, I was assured, would not appear together. The more I pondered this premise, the more convinced I became that the show’s creator, Craig Bartlett, must be a genius. If the goal is to get kids interested in science, why not tap into the two things they love most—dinosaurs and trains? And when I learned that the renowned Jim Henson Company had hooked up with PBS KIDS for the series, I realized that the offer was too good to resist. I said yes and embarked on a whirlwind year of brainstorming ideas and reviewing scripts. Each half hour of Dinosaur Train includes two episodes. 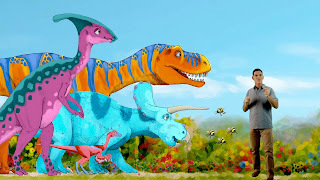 The bulk of each episode is devoted to eye-popping computer-generated animation, as Buddy and his family travel through a wondrous and whimsical (and generally friendly) Mesozoic world. 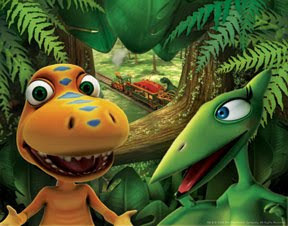 Most episodes involve traveling on the train through space and time to meet a new kind of dinosaur. In addition to many of the old standards like Stegosaurus and Triceratops, the adventurous little tyrannosaur encounters plenty of recently discovered beasts that have yet to appear in kids books—for example, the winged Microraptor and the burrowing Oryctodromeus. In addition to dinosaurs, Buddy and his Pteranodon siblings meet a variety of other animals, from frogs and dragonflies to sharks and plesiosaurs. From the beginning, it was agreed that the show’s approach to science education would be ambitious. After consulting with experts in childhood learning, we adopted the philosophy that preschoolers can learn to think like scientists, critically evaluating alternative ideas. So Dinosaur Train goes beyond the names, sizes, and dietary predilections of dinosaurs to address the way life works, both then and now. Kids are encouraged to think like scientists, making observations, generating new ideas, and even testing those ideas. In most episodes, Buddy states, “I have a hypothesis,” and he and his siblings then set out to test it through additional observations. I’m thrilled to be able to say that Dinosaur Train, which first aired on Labor Day of 2009, is already a roaring success. Millions of children all over the country and around the world are now tuning in daily to hear about Buddy’s latest hypothesis and learn more about dinosaurs. The December ratings revealed Dinosaur Train as the top-rated show on PBS KIDS, and among the top children’s shows on television. 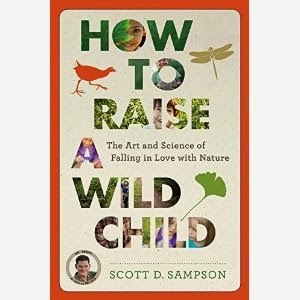 And, as I can report from numerous communications with parents, it has also become the springboard that we hoped it would be, getting kids outdoors with a renewed interest in understanding nature. 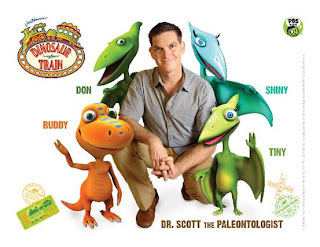 The runaway success of Dinosaur Train was underlined last Friday, when more than 700 people jammed the dinosaur halls of the Cleveland Museum of Natural History to say hi Dr. Scott the Paleontologist. Over 500 of those people were children, and I had the pleasure of meeting every one of them. Many youngsters told me of their favorite dinosaur. Many others asked questions, shared their own dinosaur-related hypothesis, or expressed conviction about becoming a paleontologist. Some gave me presents of their own artwork. Smiling parents waxed on about their enthusiasm for the show. “Ever since Sam has been watching Dinosaur Train, he’s become fascinated by the birds in our neighborhood.” “Samantha now loves to play in the mud looking for dinosaur bones.” Prior to setting out on this adventure, I questioned the ability of television to get kids outside exploring nature. But no more. Thanks so much to all of you who came out to the Cleveland Museum last Friday (and to my talk at Pittsburgh’s Carnegie Museum of Natural History on Saturday). It was a wonderful experience meeting you all! I am very grateful to be involved with Dinosaur Train, and all of us involved with the show are amazed and heartened by the enthusiastic response it has received. Thank you to all DT fans out there!